Here’s our fantasy premier league team tips GW8 article where the 2nd group of the FFGeek contributors show their teams for GW8. In this article we have Joseph Crilley, Rob Reid, Alex Ball, Rob Cosgrove and Mikael Danielsen. Another 60+ score from my team helped to cement my place within the top 100k and I’m now on the cusp of the top 50k following my 4th consecutive green arrow. 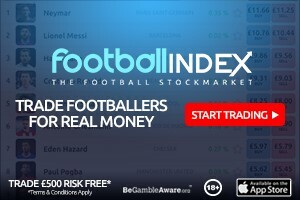 I had 7/11 returns which included another solitary goal from captain Aguero, though he was withdrawn around the 60-minute mark again which is becoming a concern. Hazard scored another cracking goal and looks well on his way to his most productive season since moving to England. Walcott and Maddison both picked up an assist in my midfield, while Moura had a couple of good opportunities but ultimately blanked during Spurs’ win over Huddersfield. The highest score of my gameweek came from that game as my transfer in of Trippier who came in for Mendy and picked up a clean sheet along with another assist for Kane. I made that move early in the week for cash purposes, so I was relieved to see the City man absent from the matchday squad again and it now sets me up with options for this weeks’ transfer. The main dilemma for myself and others this week is that man, Harry Kane, who bagged a brace last weekend and has a plum fixture this gameweek. He certainly looks the best captain option, but his high price makes it tricky to bring him in. For my team, I would either need to take out Salah or Aguero, who face each other on Sunday, with either option requiring a hit. I’m hesitant on making the move as Aguero has returned in his last 4 games and has very high ownership while Salah faces Huddersfield, Cardiff and Fulham in the next 5 gameweeks even if his form is a slight concern. There are some other factors which help convince me that I can still do without Kane in my team for now. As a Spurs fan, I am still able to enjoy the goals that he scores even if I do not own him plus I still own Moura and Trippier which means I at least have some Spurs ‘coverage’. Additionally, I have maintained from season start that it will be the case of either Salah or Kane this year given their high prices and I still think this is true. Salah looks like a strong captain option in 3 of the next 5 weeks so I am prepared to endure the likely fantasy pain this week for, hopefully, long-term gains. 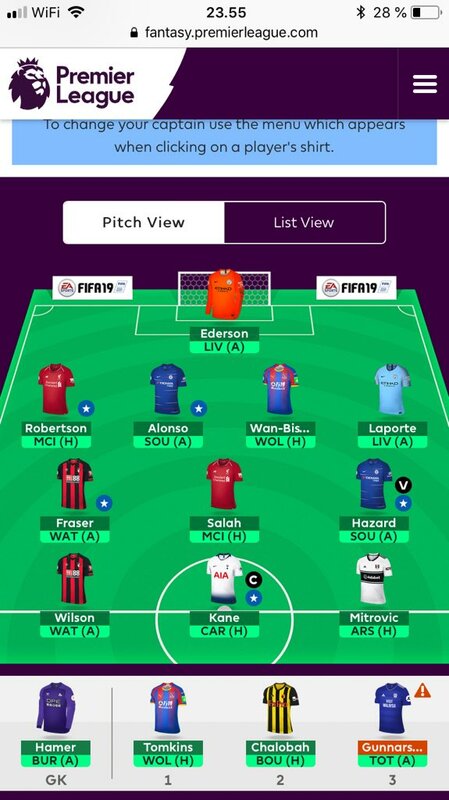 I mentioned that my transfer was made early last week for cash reasons and it has given me the option of bringing in one of Arnautovic or Mitrovic for Wilson. However, I am now looking to hold the transfer, so I can have 2 to use during the international break which could allow me to reassess the Kane situation if need be. 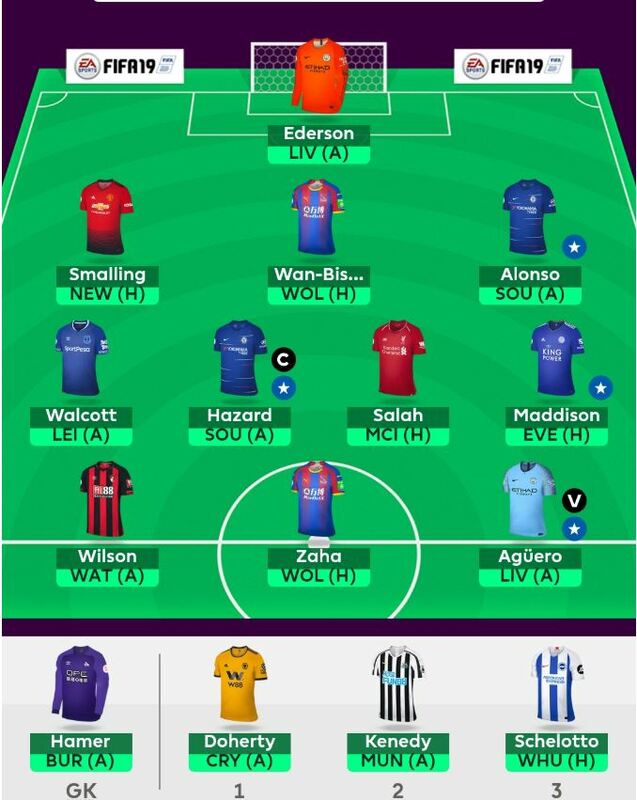 I will still be looking to bring in Mitro and/or Arnie soon, but I am happy to wait for now to give me that extra free transfer, especially as Wilson has three good immediate fixtures. As mentioned, Aguero and Salah face off at Anfield this week, so the armband is currently on Hazard who is in simply scintillating form lately. Chelsea travel to Southampton who haven’t been great defensively and the Belgian was rested for the European game midweek. I had troubles with Hazard as my captain last season, but hopefully it will be a different story on Sunday! In the end a slightly disappointing gameweek, despite 6/11 returns. A small red arrow as a result of the points hit, though the hit to bring in Vardy and Richarlison for Ings and Mane did yield an overall 4 point gain. My Saturday morning decision to play a 2nd Wolves defender also worked out, so in the end I’ll again consider it a lucky escape of a week. After much deliberation over the weekend, I decided to play my Wildcard – a week earlier than I’d initially planned. I need to reshape my squad somewhat and with there being no clear captain favourite within my current squad for GW8 and Harry Kane facing Cardiff it looks a good time to do so. Here’s what I’ve settled on. So you may recall in my Wildcard article that I was deliberating between an all-in eggs in one basket big player strategy and a more conservative hop-on/hop-off big player option. Many thanks to everyone who voted in the poll between drafts and to everyone who commented both on the site and on Twitter. The consensus was definitely that the more conservative strategy (option 3) was better in the long-term and this is what I’ve gone for. I’ve tweaked the team a little though from the draft I posted yesterday. For keepers I’ve gone for a set and forget 8.5m combo. Ryan and Fabianski were both considerations but I’m liking Patricio at the moment and I’ve paired him with Button, who (looking a long way off) may get some gametime in January when Ryan could go to the AFC Asian Cup. Injuries permitting, this combination hopefully won’t need any attention for a while. In midfield Hazard and Salah remain and I’d decided earlier that Fraser had to come in. The lure of yet another ex-Aberdeen player (I’ll get that in there again!) was too much so I’ve added Maddison as well – he’s another exciting talent and Leicester have a good run of fixtures coming up, hopefully he’ll keep racking up the returns. Budget constraints meant that my filler for Midfielder 5 is Masuaku – he’s going to warm the bench nearly every week. So onto the forwards, where most of the question marks were. Kane was always going to come in and I’ve paired him with Arnautovic and Mitrovic. I like both these cheaper options – both are in good form, Mitrovic has great GW9-11 fixtures and Arnautovic (who can score against anyone) also has some good fixtures on the horizon. From GW10-22, City are the only team of the Big 6 The Hammers face. I did explore another option where I had Vardy instead of Mitrovic, with Knockaert replacing Maddison in midfield and Diop replacing Holebas. The appeal of this was tying up more funds in one player to fund a bigger move later on, but I think the team I’ve gone for gives more balance across the board, spreading the risk more evenly. So onto Harry Kane. At present, it’s likely just to be a one week cameo with my Plan A being to switch Aguero straight back in after the international break for the GW9 Burnley fixture. After that I’ve got several hop-on/ hop-off ideas, but I may hold Kun until GW12 when City face United with a hop back to Kane or to Firmino both possible options then. Onto my team this week then: Bennett, Alexander-Arnold and Masuaku are my bench players with the armband on Kane of course. Good luck this week to everyone in the FFG Community – may your arrows be green! Another pleasing week with a score of 67 and green arrow to go with it. The double return at the back from wolves pair Doherty and Patricio really stood out to me as their price is so cheap. 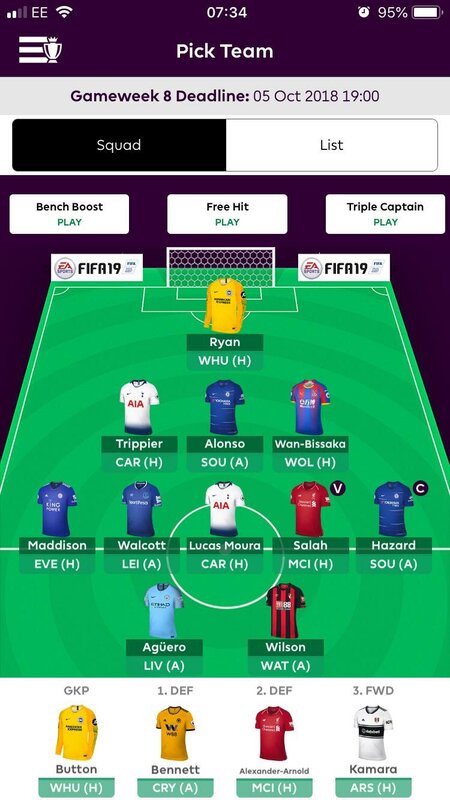 I’ve seen triple wolves at the back and it’s a slight regret I have from my wildcard a few weeks back. Returns from Hazard and captain Kun, whilst Maddison and Lacazette continue to tick over nicely. On to this week and it’s a real dilemma for me. 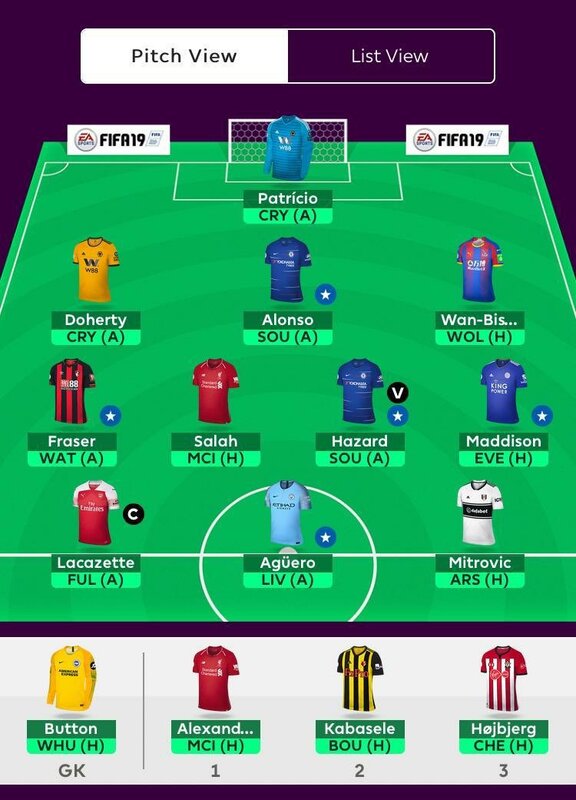 My team looks fine for the week so with 2 free transfers it feels like a good opportunity to get Kane in for Kun for one week and then back again. I like this plan as it feels like it could be a limited risk/high reward move. The issue is how to fund. In Geeks very good ‘early thoughts’ article, he raised the suggestion of downgrading Fraser to a 4.5 which I really liked. He has some nice fixtures and stats but in the short term I’m ok with going without. My other plan was Lacazette to Arnie. This just feels wrong when Lacazette is playing Fulham whose defence is woeful. Plus he has been rested in the Europa League and hasn’t been selected by France over the International Break. I have been discussing with Geek the merits of various moves, none of which we are 100% happy with but the upside feels worth the risk. If I bottle the Kane move (unlikely) it will be Kabasele to Charlie Taylor or a Brighton defender. Captain will be kane or Lacazette (if I don’t bring Kane in). Good luck everyone. 2 free transfers this week with no transfers I want to make! I cannot get Kane in just for this week so decided to upgrade my bench for the future gameweeks where I need a bit more rotation options. Due to Newcastle improving fixtures I have used 1 of my free transfers to swap Hojbjerg for Kennedy. What happened to the other contributors have just stopped updating?